Eihei Dōgen, the 13th century founder of Sōtō Zen in Japan, is known for his profound and difficult texts on practice. Shōbōgenzō Uji (True Dharma Eye, Being-Time) is Dōgen's teaching on spiritual development as the intimate non-sequential emersion in reality's 'just this.' This radical understanding of each moment's existence as being-time is the basis of practice as realization. Approaching the text in a systematic way, this workshop will explore how we can cultivate a better understanding of Dōgen's Way in modern life through talks and group discussion. The aim of this exploration is to bring Dogen's transformative wisdom into our own life and practice. To cultivate a better understanding of Eihei Dōgen's Dharma and apply Dōgen's teaching to one's daily practice. Shinshu Roberts is co-founder and teacher, with Daijaku Kinst, of Ocean Gate Zen Center in Capitola, CA. 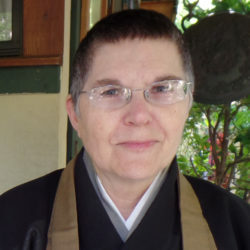 She is a Dharma heir of Sojun Weitsman Roshi, Abbot of the Berkeley Zen Center, in the Soto Zen lineage of Shunryu Suzuki. She holds the appointment of International Dharma Teacher in the Japanese Soto Zen school.